Thoughtfully positioned, arrangements in autumn-inspired colors and textures are an easy, affordable way to create a living room with an organic feel. Fall is the season of harvest, of bounty in terms of fruits, vegetables, scents, and foliage, of brilliant colors, and family gatherings. When thinking of fall, pumpkins, gourds, apples, nuts, and beautifully-colored leaves immediately come to mind. Any kind of arrangement with these elements can lend an unmistakable autumn look to any space. 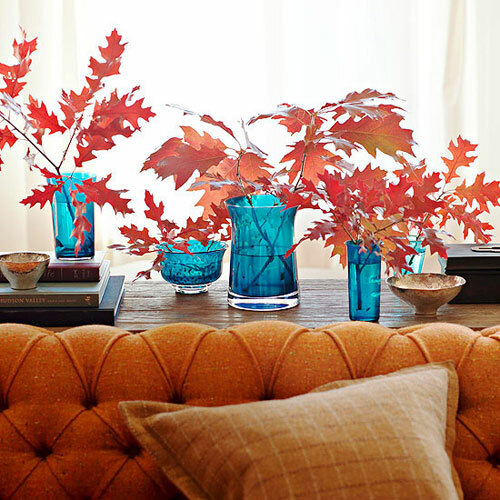 Even a clear glass vase with a bundle of leaves or grasses positioned on top of a coffee table can do the job. 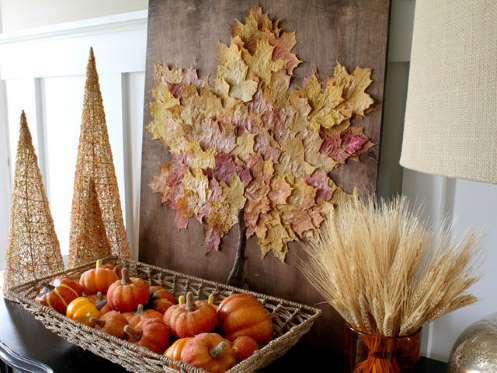 Budget-friendly DIY art projects with dried leaves offer an array of options to dress up the mantel with some fall decor or walls. 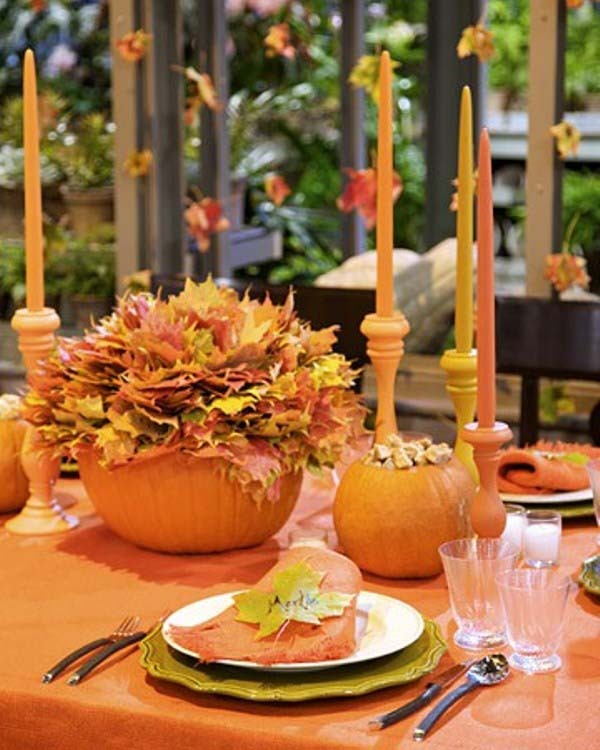 Focus on incorporating candles, complemented by nuts and berries, they help create eye-grabbing autumun centerpieces. Flowers introduced as bouquets or potted in different containers are also a stunning way to add autumn touches. As they create a sense of warmth and coziness, throws and blankets are also an option to consider. Actually, decorating with fall-inspired colors is a favorite way to infuse any living room with warmth and comfort and lend it a pleasing look all year round. From burnt orange and burgundy to yellow to chocolate and dark purple, a plethora of hues can help create an inviting space with a fall vibe. Including any color doesn’t necessarily mean painting or changing furniture, an array of ways offers affordable options to do this, such as adding new throw pillows, curtains, or accessories. Usually, throw pillows are the easiest way and most favorite way to introduce pops of color. Note that when used creatively, in an unexpected manner, even small-scale splashes of color can make a big impact and completely transform the look and feel of any space. 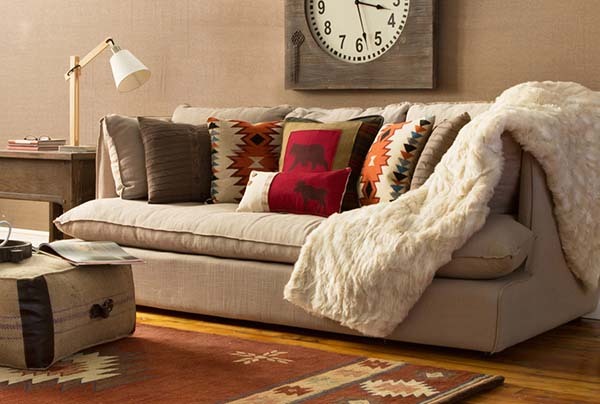 Above, an adorable fall-inspired living room with an organic vibe. 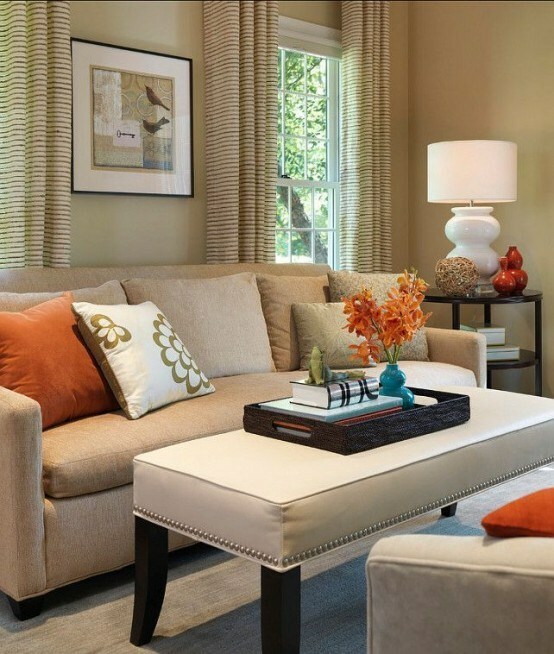 Throw pillows in harvest hues stand out against the background of a white sectional sofa. Wood creates a sense of warmth and coziness. Thoughtfully scattered around the space, accessories in different shades of brown add extra fall touches and visual appeal. Above shown, oranges, browns, and blue greens create a cozy atmosphere. 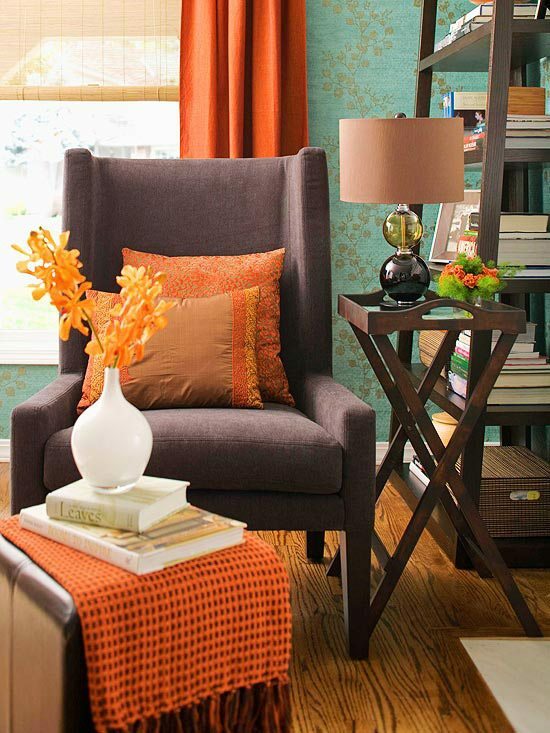 Throw pillows, curtains, a runner, and a lampshade in vibrant hues work well together to lend this inviting space an enchanting fall-inspired look. Flowers add extra color and freshness. In the above-shown neutral living room filled with natural light, throw pillows, an oversized piece of wall art, a throw, and flowers offer a way to add fall colors. Wood furniture helps create a sense of warmth, coziness, and comfort. Get creative and opt for some bold hues to create truly exciting spaces. In the picture above, a flooded with natural light living room with a saffron yellow sofa and a scarlet armchair and ottoman. This definitely bold color combo adds warmth, coziness, visual interest, and personality. A floor-to-ceiling stacked stone fireplace makes a stunning focal point. A striped area rug, a woven storage basket, and an apple arrangement on a tray add to the fall vibe of the space. 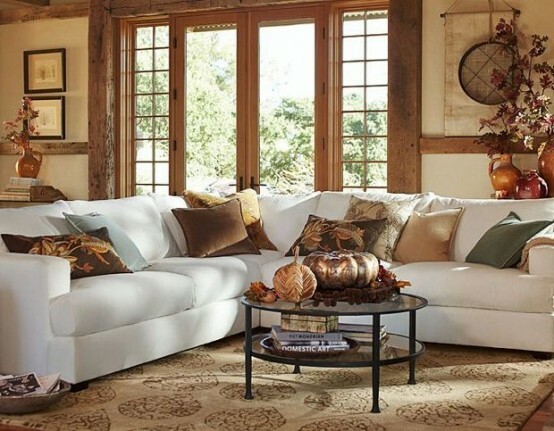 Whatever the design style, traditional or with a contemporary twist, fall-inspired living rooms always exude warmth, coziness, comfort, and visual appeal. In classic harvest hues or in bold, unexpected colors, they are usually peaceful, delightful spaces with tons of personality, a symbol of the bounty of fall colors, textures, patterns, and scents. Using different textures helps lend any space, especially neutral and monochrome ones, a layered, complete look and make them feel balanced and cozy. Furthermore, a room without elements that offer a variety of textures feels cold and uninviting. Common ways for introducing textures are textiles, furniture pieces, rugs, and plants. Knitted, fur, and faux fur throws, blankets, quilts, and throw pillows, wood, leather, velvet, and knitted pieces of furniture, ethnic-inspired and sisal rugs, tapestries, tablecloths, and grasscloth wallpaper are some of the favorite options. When it comes to patterns, textiles, such as throw pillows, window treatment, rugs, wall coverings, and upholstery are solutions to choose from. 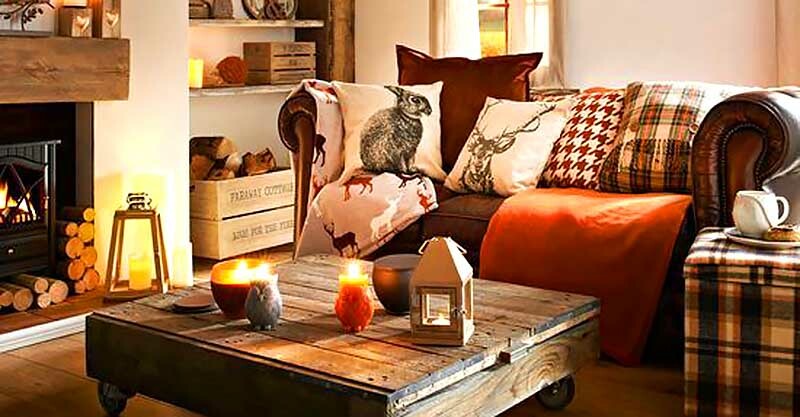 Note that plaids and stripes in deep, warm hues also an option to add autumn touches to any living room. Above, a cozy living room. A throw, an area rug, an ottoman, wood furnishings, and a bundle of throw pillows work well together to add color, texture, and pattern to this living room, lend it a complete, layered look, and create an inviting atmosphere. In the above-shown picture, a stunning arrangement of red oak branches in blue vases of different shape, size, and height for extra visual interest adds color and texture to the space. What a simple and budget-friendly yet creative way to create a sense of movement and an organic vibe and bring fall touches! Simplicity can be so beautiful! On a side note, fall leaves help create affordable yet eye-grabbing seasonal décor. Whether fresh or dried, framed or not, painted or not, attached to walls or even furniture pieces, when creatively used, some leaves can transform any space and lend it a charming, elegant, autumn-inspired look. Consider also leaf garlands and mobiles, they are an awesome way to create a sense of movement. When it comes to scents, generally, fall is associated with pumpkin, cinnamon, and apple scents. 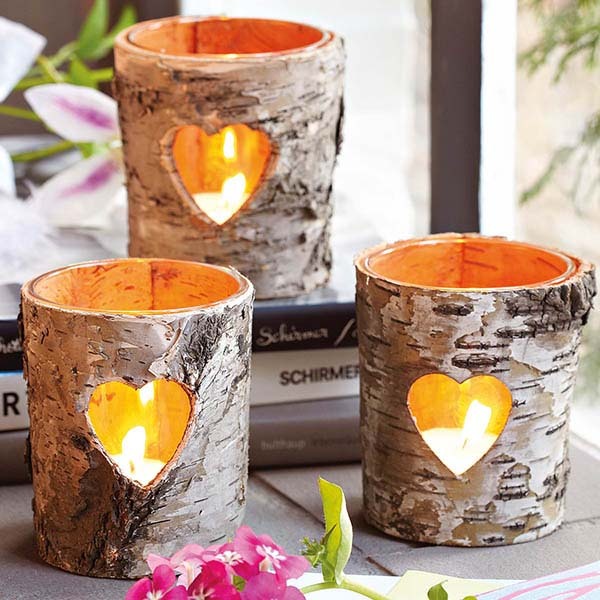 Scented candles, homemade potpourri, garlands of dried fruit slices, herbs, and cinnamon sticks, pumpkin pies or bread, or simmer pots are just some of the ways to use scents for adding autumn touches to any space. Usually yet not necessarily poisoned on mantels and coffee tables, fall centerpieces are an awesome way to celebrate fall’s bounty. Whether dried flowers, leaf prints, fruit, branches, nuts, scented candles, feathers, wheat, or seeds, there is a plethora of seasonal beauties that can be used to create eye-grabbing displays. Positioned in different containers, these groupings are a simple, easy, frugal yet charming way to add color and texture to any living room. However, as pumpkins, gourds, and apples are inherently associated with fall, you can’t go wrong using them to make fall-inspired centerpieces. Painted or not, pumpkins and gourds, as well as apples, can be arranged in cloches and apothecary jars, on trays, cake stands, candle holders, decorative urns, and more to vary height. In the picture above, an awesome display. 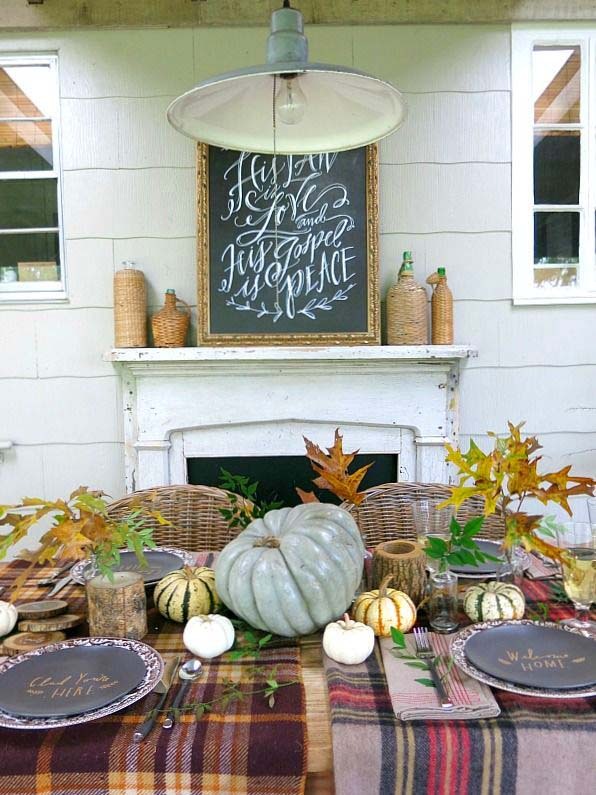 Dried leaves complemented by small pumpkins help create a fall-inspired space with an organic vibe. Cones of different height add sparkle, touches of sophistication, and extra visual interest. Truly impressive! 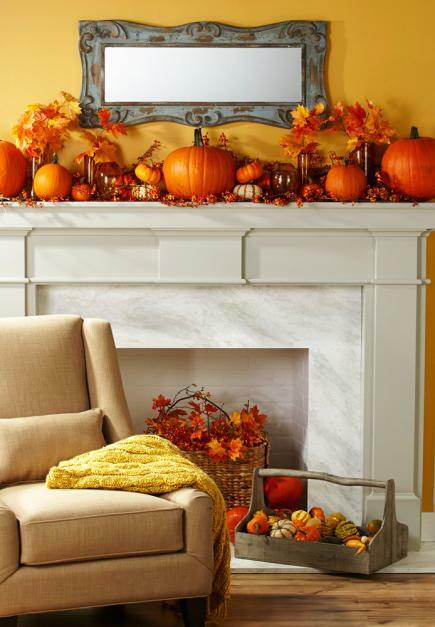 Above shown is an adorable fall mantel. 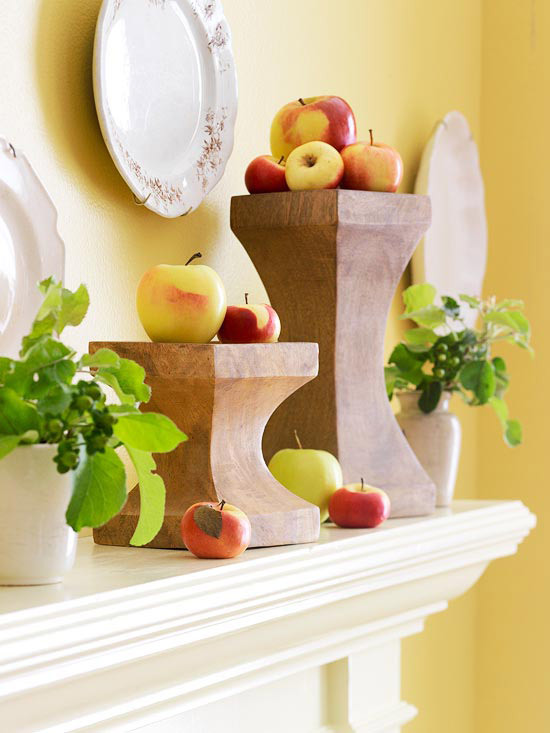 Apples arranged on wood urns are complemented by potted plants. A decorative plate collection on the wall just behind the fireplace adds extra visual interest. What a way to celebrate fall! Above shown, pumpkins of different size, leaves in simple vases, branches, a wicker basket with more leaves create a truly jaw-dropping display, which help lend a warm, autumn look. 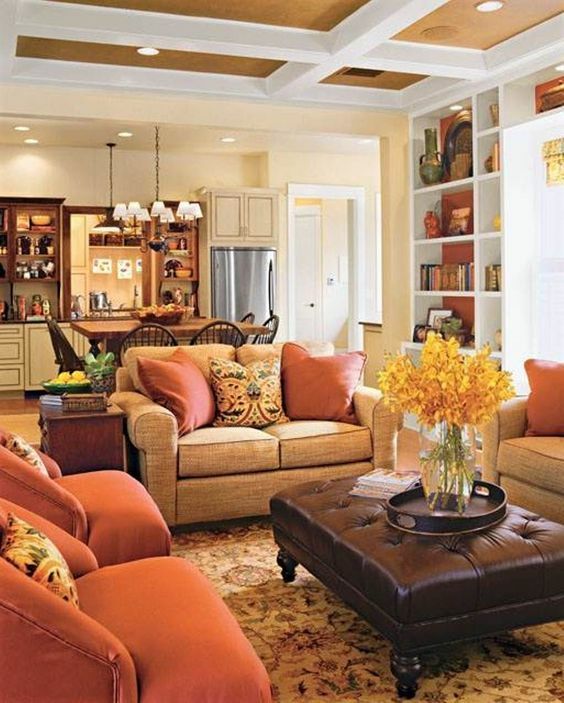 When it comes to adding autumn touches to any living room, it doesn’t necessarily mean to completely change its décor. Incorporating warm hues that mirror the charming fall ones, such as yellows, reds, purples, and oranges even on a small scale, bringing textures and patterns to lend the space a complete, layered look, creating centerpieces with seasonal beauties, and filling the room with fall scents can help create an inviting autumn ambience. If you liked this articles please SHARE it with the buttons below! Thanks!